...Not to be a kill-joy, but maybe a girl who doesn't want to go into debt over shoes! 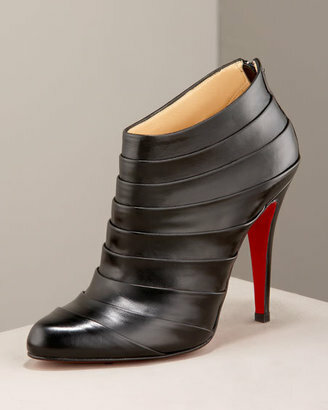 In honor of the occasion, you could pick up these red-sole Christian Louboutin look-alikes instead. 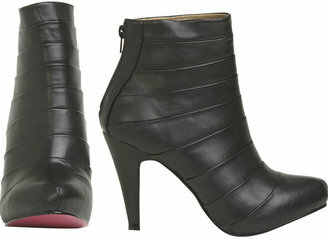 Aptly named the 'Bandage Bootie,' these knockoffs cost just $29.50 at Wet Seal. Can you find a cheap knock off of the TOUT ROND SLINGBACK? I can't swing the GILT prices. Thanks! Anything close to that one or the Matador 100 M slingback would be fabulous! You do the best job of finding affordable knockoffs! can you sell on this site? Didja nab anything from Gilt, lady? I heard everything sold out in SECONDS! Everything I wanted from the Gilt sale sold out like 20 sec. after the sale started. If anyone lives in the Minneapolis/St. Paul area, there is a store called Opitz and they sell new Louboutins, Jimmy Choos, Prada, Chanel, Stuart Weitzman, Ferragamo, you name it...for like 70-80% off. I will finally own real Louboutins! haha...okay they're still not in my budget...but if you've got $120-$250, they have a lot of amazing shoes! oh i know! everything sold out so fast on gilt! are those on the wet seal ones red or pink soles? Yea, I'm pretty sure someone had to have sharked that site because everything was gone within like the first minute! Seriously, everything I cliked on gone gone gone sad. OH well not like I should have bought a pair anyways. Same thing happened to me! I hesitated on a pair of classic pumps and by the time I went to check out "another member" had my size in their basket!!! i was SO sad when i found that i couldn't find a THING in my size. sigh.